A monument and museum in Moscow, Russia, about rocket science and space exploration, especially that undertaken by the Soviet Union, including the pioneering first satellite (Sputnik) and the first manned space flights (as well as the first dogs in space). Some dark aspects are also covered (accidents, failures, ICBMs), but overall the celebratory tone obviously dominates. It's an absolute treasure trove for anybody with any interest in this subject matter. More background info: As the Soviet Union enjoyed its being ahead of its big rival the USA in the early phases of the space race, after the first launch of an artificial satellite (Sputnik in 1957) and then that of the first man in space (Gagarin in 1961), it became clear that these achievements had to be celebrated in propagandistic fashion in a more lasting form than just parades (or Gagarin travelling around the world). And so in 1964 the Monument to the Conquerors of Space (Монумент «Покорителям космоса») was erected just outside the VDNKh in Moscow. Apparently the first plans for its erection and a competition for the best design had already begun in the year after Sputnik's launch – and it was inaugurated on Sputnik's 7th anniversary. Its sweeping titanium needle with a model rocket at the top is a soaring 107 metres high (350 feet). Its base features some fantastic bas-reliefs. And underneath the base, a large area to accommodate a Space Museum was part of the plan all along and its administration was founded in 1967. However, it took a long time before that idea was actually turned into reality. The first incarnation of the museum opened in 1981 and served its role for 25 years until its closure in 2006. 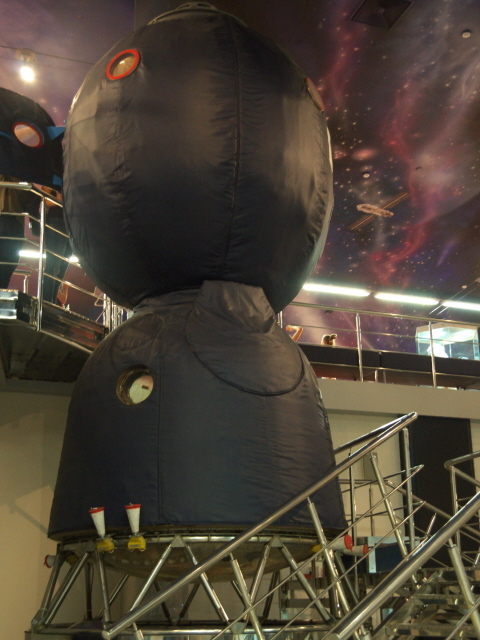 Three years later, after a thorough renovation and expansion project, the new Cosmonautics Museum opened again in 2009, with a modernized and significantly more comprehensive permanent exhibition. I vaguely remember the old museum from my visit to Moscow in 1999 (when the whole VDNKh complex was a sorry shadow of its former glorious self) and can confirm that the transformation into the current museum is indeed a massive one. It's probably three times bigger now than it used to be and covers much more topically too, including non-Soviet/Russian aspects of the Space Age right up to the present day. What there is to see: The Monument to the Conquerors of Space is a fantastic example of Soviet sculptural modernism. Its soaring needle is clad in shining silver titanium and its shape recalls the thrust of a rocket during its launch. And indeed, right at the top is a little silver rocket … not a realistic one like the then Soviet R-7-derived launchers but more a comic-book classic design (more reminiscent of a V-2 actually). Its sweeping flight path really gives the impression of movement and a bright (literally) future. It is not straight but somewhat inclined at ca. 75 degrees, which just adds an extra element to the dramatic shape. The plinth at the bottom is adorned on both sides with exuberant socialist-realist bas-reliefs, showing mostly scientists and technicians at work, but also classic muscular workers, and a stern-looking Lenin pointing ahead. Look closely and you can also spot a little dog amidst the scenes (presumably Laika, the first space dog – see below). At the time of my visit (summer 2017) a fence prevented visitors from getting close and touching the artwork – since bits of the stone cladding were crumbling and in some places had indeed already fallen off in dangerous chunks. I presume that rectifying this will be the next task at this site. The fence around the whole complex features space-age ornamentation (like little depictions of Sputnik). And in front of the monument the so-called “Cosmonauts Alley” leads south through a park. This is lined with busts of significant contributors to Soviet space glory, but not just cosmonauts. In addition to Yuri Gagarin (the first human in space), Valentina Tereshkova (the first woman in space), Alexey Leonov (the first to take a “spacewalk”) and some of their space-flying colleagues, there are also busts of significant rocket and spaceship designers who didn't actually go into space themselves but were still instrumental in making that possible in the first place, in particular Sergey Korolyov, Valentin Glushko, and the very first Russian pioneer of rocket science: Konstantin Tsiolkovsky, whose 'rocket equation' of 1903 has been one of the fundamental pillars of the maths involved in making space flights possible. Inside the Cosmonautics Museum, the large foyer serves as a space for extra temporary exhibitions – when I visited it was a photo exhibition of images taken by 21st century cosmonauts that illustrate various kinds of contemporary environmental damage on Earth. I was surprised how outspoken the general drift of this exhibition was, explicitly it declaring that the “point of equilibrium” (where the amount of man-made destruction surpassed nature's ability for restoration) was passed about two decades ago (cf. climate change). In addition there are some modern additions of Space-Age artwork in the foyer, a gift shop and, of course, the ticket counter. The main leftover from the museum's old incarnation from the 1980s (before the 2006-2009 revamp) is a fantastically OTT installation featuring a large statue of a cosmonaut (Gagarin, presumably) in a spacesuit and with both his arms lifted up in a gesture that looks partly triumphant, partly messianic. He stands in front of a swirl of semi-abstract, semi-socialist-realist shapes and a large stained-glass window, framed by two silver columns – it's almost like a cathedral altar. The most significant exhibits in the first hall are a model of Sputnik-1, the world's first artificial satellite to orbit the Earth, as well as a model of the capsule of Sputnik-2. The latter was the spaceship in which the first mammal in space, Laika the dog, was shot into orbit in November 1957. Laika, a stray picked up from the streets of Moscow, had a sad fate, though. She died from overheating within hours of the launch – but this was at the time kept secret. She was never intended to return to Earth in any case, though. She would have run out of oxygen within less than a week. However, her successors Belka and Strelka (also former stray dogs) fared better. They were the first animals to be successfully returned to Earth in August 1960. Not only did they survive, Strelka went on have puppies, one of whom was later presented to US president J.F. Kennedy as a gift. Belka and Strelka also made it to fame in Soviet/Russian pop culture, which is still alive and kicking (an animated feature film about them was released as recently as 2010). The real Belka and Strelka, however, are not. They are now stuffed and on display here at the museum standing in glass boxes next to the kind of vehicle they went into space with (accompanied, by the way, by a host of other animals, including mice and rats and a rabbit). Incidentally, contrary to what you can read in guides such as the In Your Pocket series, the museum's texts are predominantly but not exclusively in Russian. While translations are far from comprehensive, there are at least short summaries in English. These rudimentary translations are not perfect but do help a lot. Back to the main exhibition. Other significant objects on display in the first hall include some of Yuri Gagarin's personal belongings, his Vostok space capsule [update: I've been informed that this has now been moved to the Cosmos Pavilion in the VDNKh! ], various space probes and the space suit worn by Alexey Leonov on the first spacewalk in history. Also still in this part of the museum is a cinema hall that is worth peeking in even when no video is being played. The interior design is like a film set of a 1950s Sci-Fi-flick. Bizarre. The next section is about rocket science pioneers, featuring early rocket models, ambitious design ideas, actual propulsion systems and various objects related to great names such as Glushko and Korolyev (see above and also the Cosmonautics and Rocket Technology exhibition at Peter & Paul Fortress, St Petersburg). Then you step into the largest section of the museum, which is a big hall with exhibits spread out over two levels. There are far too many exhibits here to comment on comprehensively, so I'll just pick out a few. There are models of space stations, such as the earliest, called Salyut, the legendary Mir and the current ISS (International Space Station). Moreover there is a space-station mock-up you can look into. The space toilet caught my eye in particular (see the relevant image in the photo gallery below to see why). In a side room, there is a rather large section on experiments conducted in space, including medical and biological research. It gets quite technical in this part. It's worth noting that the coverage is not limited to Soviet/Russian space programmes but also gives some room to other countries' achievements too, including those of the USA's NASA and Europe's ESA. On the lower level, the exhibition continues. If you want you can break your visit at this stage by going to the museum café, which also serves space food (in case you ever wondered what whatever comes out of all those tubes and packages tastes like). On display downstairs are various models of rockets, including, of course, the highly successful Soyuz series, but also the greatest and most tragic failure of all Soviet designs: the N1, a monster of a rocket. It was of a similar scale as the American Saturn V and also intended for manned Moon missions. But unlike its American counterpart it never got as far as launching any such missions. Four launch attempts failed, one of them so spectacularly that its explosion on the launch pad is listed in the world's largest non-nuclear detonations ever. The programme was eventually cancelled. However, while a manned Moon mission was not achieved – and anyway, the Americans had already won that race with Apollo 11 – what the USSR did manage were unmanned missions, including the landing of a remote-controlled rover called Lunokhod that managed to collect and analyse moon rock samples and take tens of thousands of photos. A life-size mock-up of Lunokhod celebrates this. As does a small but spectacular exhibit nearby: a sample of genuine Moon dust [update: I've been told that this too may meanwhile have been moved to the VDNKh's Cosmos Pavilion]. In addition there is a mock-up of the projected manned lunar mission module (actually not dissimilar in basic design to Apollo's Lunar Module), even though none ever actually got there. Other than that there are yet more space capsules, in particular Soyuz capsules: one real one with a scorched outer surface from re-entry plus life-size mock-ups, including one you can look into and another that illustrates a landing off course and the survival measures cosmonauts were trained to take in such emergencies (this has happened more than once, even as recently as 2008, when a Soyuz came down almost 280 miles from where it had been supposed to touch down). The Soviet Buran (and the US equivalent Space Shuttle) gets a fairly proud mention too, and elaborate large models as well, even though the Soviet Buran never made it to operational state and the US Space Shuttle was withdrawn from service after its major accidents with Challenger and Columbia (which are not a topic here, though). While some rockets, shuttles and other man-made things never managed to go up into space, natural objects sure as hell dropped down from outer space: meteorites. And a couple are on display in this museum – even as hands-on exhibits. It is of course a strange kind of feeling to touch some extraterrestrial entity such as this! One small section covers the rather darker aspects of space missions, namely accidents – and/or narrow escapes, such as that when in 1983 a Soyuz launch escape system rescued a two-man crew at the last second as the rocket underneath them went up in flames. Such escape systems are designed to take the capsule away from the rocket by means of small boosters that can carry the capsule just high enough so it can land safely using parachutes. This was the only occasion when such a system was fired with a crew aboard in an actual accident – and fortunately it worked just fine. Some debris from this incident and from other accidents is on display, but the detailed explanations are in Russian only. Another dark side of the topic of rocket science is of course military applications, in particular ICBMs designed to carry nuclear weapons. And this aspect is also covered by some models, including one of an underground missile silo and of a multiple warhead (MIRV). There are some interactive elements too, such as one screen where you can punch up details of all the nations that were ever represented in space, which throws up some interesting revelations ... e.g. would you have guessed that the first, and until 2015 only, Briton in space was a woman, that Bulgaria sent as many people into space as Britain (two), and that countries like Afghanistan and Syria also sent a cosmonaut each into space? Unfortunately, though, these screen stations are in Russian only, so you have to at least be able to decipher the Cyrillic script to get anything out of them. All in all: having always, since childhood, had a soft spot for all things space-related, this museum was a delight for me. Other, not so technology/science-minded people will probably get less out of it, but may still find it worth seeing at least superficially. In terms of dark tourism only certain aspects are especially relevant (accidents, nuclear missiles), but the whole aura of rocket science and space exploration as a risky business gives it a darkish undercurrent as a matter of principle, I'd say. Location: in the north of Moscow, some 5 miles (8 km) from Red Square (as the crow flies), between Prospekt Mira and the VDNKh. Access and costs: Easy to get to by metro; not expensive for what it is. Details: To get to the museum/monument from the city centre get metro line 6 (orange) to VDNKh. Take the north exit (front of the train) and once above ground turn left and you'll soon see the 100% unmissable space needle monument. The entrance to the museum is on its northern side. The Monument to the Conquerors of Space is freely accessible at all times (and is nicely illuminated at night), but the museum has the following opening times: Tuesday to Sunday from 10 a.m. to 7 p.m. (to 10 p.m. on Thursdays), closed Mondays. Admission: 250 RUB (free on the third Sunday of the month); last admission half an hour before closing. Time required: Depends on a) whether or not you can read Russian, and b) on how deep your interest in the technical aspects of space exploration is. Technology-and-science-minded fans of the subject can probably spend at least half a day in here. Others can probably do with one to two hours. Combinations with other dark destinations: The huge VDNKh complex is very close to the museum and thus makes for the most natural combination. At the time of my visit (summer 2017), the Polytechnic Museum also had its temporary home in one of the VDNKh's pavilions (No. 26), but will eventually move back to its original home in the city centre when its extensive renovation is completed (possibly at some point in 2018). The Cosmonautics Museum is also right opposite the “Vystavochny tsentr” station of the Monorail that can take you to the Ostankino TV Tower. Another impressive example of Soviet modernist architecture is the gigantic crescent-shaped Hotel Cosmos on the other (eastern) side of Prospekt Mira (see under Moscow). And perhaps the most classic and most iconic of all Soviet-era sculptures is the Worker and Kolkhoz Woman monument (see under VDNKh >combinations). Combinations with non-dark destinations: Other than the VDNKh there is really nothing much of tourist interest out here – rather head back to the centre of Moscow.